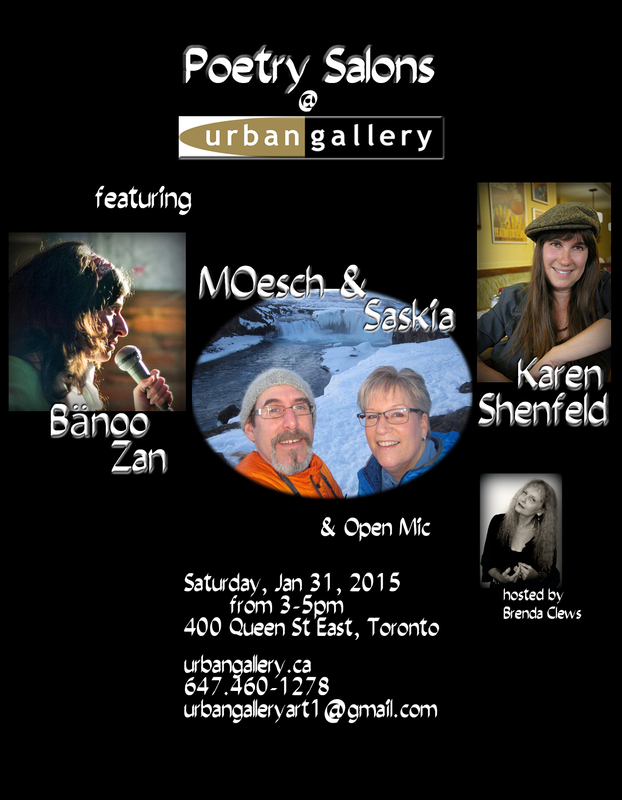 On Saturday, January 31st, poet and painter Brenda Clews will be hosting the January Poetry Salon at Toronto’s Urban Gallery. The event will feature wonderful poets Karen Shenfeld, Bänoo Zan, and Saskia van Tetering, and talented musician Michael Oesch. There will be an open mic, with 6 spots of 5 minutes each. Book Award for Poetry and was long-listed for the Relit Award in 2005.
believes her politics is her poetry. back and play his lap steel guitar. SASKIA VAN TETERING is a lifelong lover of words, especially poetry. first book, life unmasked, comprising poems and short stories. Ontario, with Michael and their fluffle of bunnies.